As far as Hollywood is concerned, this is the new age of the gladiator. With the film starring Russell Crowe winning accolades for its portrayal of ancient blood sport, it shouldn’t come as a surprise that modern warriors are filling arenas from Japan to B.C. as people watch men battle it out in contests known as ‘ultimate’ or ‘no-holds-barred’ fighting; competitors use elements of wrestling, boxing, and martial arts to subdue or knock out an opponent. What will come as a surprise, is that at least two contestants from this country are born again Christians who share their faith both in and out of the ring. Vernon Alliance Church. Dean Zilkowsky, who fought on the same card as Armbrust at a March event, instructs students in Jeet Kune Do concepts — a hybrid of 28 different martial arts developed by film legend Bruce Lee — in Langley, B.C., and attends Vancouver Christian Centre. The two men are aware of the uneasy relationship between their faith and the brutal sport they participate in. Ultimate fighting has very few rules, and some people are loathe to even call it a sport. In three-round bouts, contestants can’t eye-gauge, kick, knee or punch their opponent in the groin, or hit him in the back of the head. Everything else goes. To stay clear of liability and negative publicity, several Canadian provinces and U.S. states have banned the events, which are usually broadcast on pay-per-view television. Philippians 4:13 on the back of his shorts. However, he points out that competitors have a great deal of respect for one another and don’t see matches as a chance to beat someone up. “You genuinely do care about the other fellow. I’ve been at fights where guys are hugging each other before and after the matches,” says the 29-year-old. Zilkowsky concurs. The father of three girls aged seven, three and one, says there are very few people who can understand the desire to test their physical metal against another human being. Both men say they grew up in rough environments before they became Christians. Armbrust accepted Christ seven years ago, after he bumped into an old acquaintance who had turned her life around. New Evidence that Demands a Verdict. Aside from working with ministries at Vancouver Christian Centre, Zilkowsky works full-time training people in Jeet Kune Do concepts. His students usually take his classes to learn self-defense techniques, to build up their confidence and to get in shape. “I quickly weed out people who are there for the wrong reasons — people who want to use the stuff for banging in the bars,” he says. The 27 year old also focuses purely on technique in his classes, ignoring the mystical elements commonly linked with martial arts. When considering the motives of those stepping into the ring, Zilkowsky says one must consider each individual and the ‘life influences’ that led them into fighting. “What it boils down to is the competitive spirit, which is in us all,” he says, adding that people who come from rougher neighbourhoods can relate to the training regime and toughness required to compete in ultimate fighting. His peers at church know what he does and most take a non-judgmental approach. “[Fighting] doesn’t seem like a real Christian thing to do. But, I don’t know if it’s wrong to do,” he says. Armbrust sometimes feels out of place at church and says his ‘hobby’ — only the elite fighters who compete in Japan take home enough money to call it a career — keeps him from finding a “nice Christian girl. Although Armbrust is considering leaving, those involved with the sport say Armbrust is on the cusp of moving into its elite ranks. The Vernon Morning Star earlier this year. 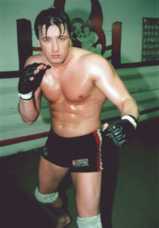 Jesus is Lord Gym, and renowned ultimate fighter Mark Coleman praises Christ after his victories. Armbrust is quick to point out the word ‘courage’ is mentioned over 40 times in the Bible.